On this page I will show some of the historical places near home . 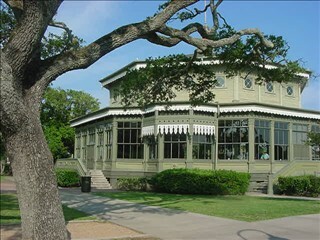 Here is a picture of the Garten Verein in Galveston , Texas . It is very old and well restored . the octagonal building was built in 1880 , and is one of the few large buildings that withstood the terrible hurricane of 1900 . It holds an octagonal dance floor with a stage and a ring of railings around the floor . When I was young my Mother and father used to take us there for square dances , and we would play in the surrounding park grounds . The daughter of a friend of mine had her wedding there last year . 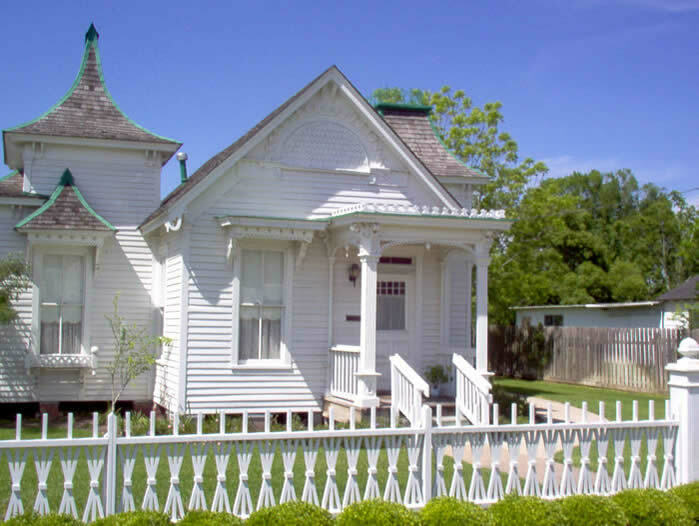 Here is a picture of an historical house in Alvin , Texas , The Marguerite Rogers House and Museum . It was built in the 1900's from cypress lumber salvaged from a home in Velasco , Tx .which had been destroyed by the famous 1900 storm . Unfortunately only a few old tools are displayed in the workshed . One is a foot-powered scroll saw , another is an old wringer from an early washing machine . The kitchen does have some interesting utensils displayed . Some of the original gingerbread trim that was used as patterns for the restoration have been preseved also . Inside the home are period examples of furniture , etc. , many from the original owners and many donated to the museum .